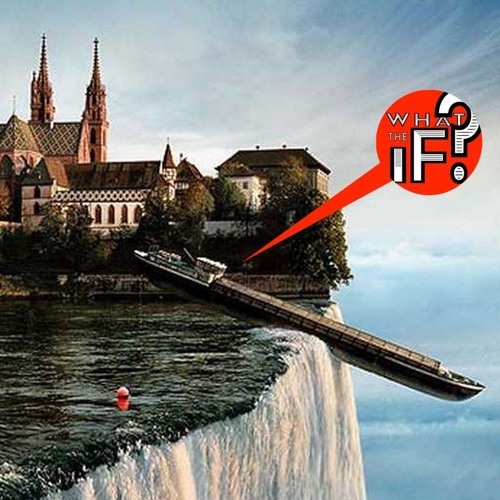 21 - Welcome to FLAT EARTH, Safety Not Guaranteed by What The If? • Email us feedback@whattheif.com, let us know you're listening & share your thoughts! FLAT EARTH: words the strike fear into the heart of every fact loving, rational thinking human. To imagine it is to fall into the depths of insanity, stupidity, comedy, tragedy. Oh, the madness! And yet (WTF?!!!!) people are all chitty chatty these days about the Flat Earth theory. Inexplicably (seriously, WTF?!!!!) basketball players are at the forefront of the Flat Earth crusade... I mean, you'd think that they'd want the world to be shaped like a basketball. Ok, breathe, breathe, flat earth is a joke of an idea, people haven't believed the Earth was flat since Columbus sailed the ocean blue... right? Well, not right, with apologies to every grade school teacher I had, this wasn't true. Thanks to the tremendous bank of knowledge that resides in the brain of Professor Matt, our guide to all things IF, we learn the truth of how *ancient* people figured out that the Earth was round, and they probably played better basketball, too. Flat Earth is synonymous with silliness, it has, as they say in Science, a crazy high "giggle factor". And yet, and yet... And yet we are COMPELLED to envision it. Let's face it, it's an incredible What The IF, and baby, we go there. We go ALL THE WAY there. Don't bother fastening your seatbelts, since there's no hills we can fall down on this bizarre flat planet, but there's no shortage of completely bizarre things we discover on this Pancake Earth. I mean, seriously, I ain't kiddin', I just got back from a tour of it with Matt and trust me, it is really, really strange, and I'm not even talking about what happened when we reached the EDGE. Come with us, enter the WTiF Machine and we'll take you to the where the world is FLAT. You won't forget this episode, let's go!